MWG is having an Exhibit! We hope that EVERYONE in the guild with submit something to exhibit. Does not need to be woven but should be a textile item. If you cannot drop off during the setup time – contact another member to bring your item. Download, complete and bring the inventory sheet with your labeled exhibit pieces to Costick for hanging. We also need some images of work to share with Costick for PR purposes. Submit these images to njpeckmc@gmail.com. When selecting your items for exhibit, consider whether they will be for sale or not. If NOT, please mark very clearly on the work. As a benefit of exhibiting, a few items are sold every year. Costick Center provides a gallery venue and publicity to MWG for our exhibit, a far larger contribution than the 30% commission from the sold items. should be filled out and sign prior to dropping off your fiber pieces. The Michigan Weavers Guild (MWG) is a volunteer organization. It’s success depends on the efforts and passion of fiber artists in Southeast Michigan. Nancy Peck will be stepping down from this post. We are in “desperate” need of a replacement. Please consider tackling this assignment. If willing contact Nancy Peck. Friday, November 16, 6:30 – 8 p.m.
We’re having a celebration! Mark your calendars to participate and share in the excitement of MWG’s Exhibit opening. Costick staff is working with us on promoting the event Friday evening, 6:30-8p.m. MWG members are invited to bring treats to share. (no alcohol allowed). The evening will have traffic at the Costick Center as the Farmington Youth Theatre will be having a performance of ‘Shrek the Musical’ at 7 p.m.
See our workshop page for additional information and instructions on how to sign-up. This will be a slide presentation and a show and tell of examples of Guatemalan weavings collected during two visits to Guatemala. Susan has been fascinated by ethnic textiles and will talk about how you can use these textiles to inspire your work. Susan Lolli and been weaving for over twenty years. 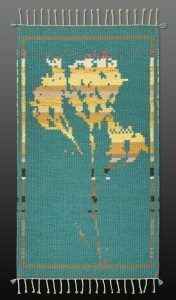 She has been active in the Michigan Weavers guild for many years and a member of the Cross Borders Study Group. She has also been a volunteer at the Weaving Shop at Greenfield Village since her retirement from “paid” employment. As usual – bring your textile creations to our “Look What I Have Done” to show to provide inspiration to the group. From the last month sharing – the vest Susan Lolli wore was a Vogue Tilton Pattern V8777. It is no longer produced but you may be able to find a copy on eBay or another site.